Captain Clint Carroll, U.S. Navy, commanded Amphibious Squadron 3, the Essex Amphibious Ready Group, and USS Robert G. Bradley (FFG-49). He has deployed to the Pacific, Africa, the Middle East, and the Mediterranean. 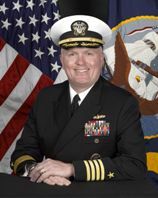 Captain Carroll served as the deputy commandant of midshipmen at the U.S. Naval Academy, in the operations directorate of The Joint Staff, and as a Quadrennial Defense Review analyst on the Chief of Naval Operations’ staff. Captain Carroll holds a BS from the U.S. Naval Academy, an MBA from San Diego State University, and an MS from the National War College. He was a Joint Staff Fellow for the Massachusetts Institute of Technology Seminar XXI Program.